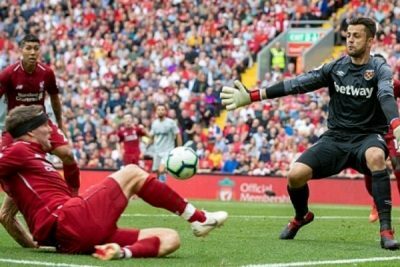 Saido Mane grabbed a brace, while Mohamed Salah and Daniel Sturridge scored the other goals as Liverpool thrashed West Ham United 4 -0 in their English Premier League fixture at the Anfield Stadium on Sunday. Sallah opened scoring for the Reds in the 19th minute after fine work by Naby Keita and James Robertson on the left. Mane added the second two minutes into stoppage time tapping into an empty net after he was set up by James Milner. The Senegal international is now the first Liverpool player to score in three consecutive opening-day fixtures since John Barnes between 1989 and 1991. He scored his second of the game in the 53rd minute after he was played through by Roberto Firmino though the Senegalese appeared to be half a yard offside. Substitute Daniel Sturridge added the fourth three minutes from time tapping home from two yards out after a corner was flicked towards the back post.